Bike Show season is upon us. What’s your most compelling reason to attend? We posed the question during a recent chat I facilitated on Motorcycle Mojo Magazine’s FaceBook page. These riders tell us why they go. Add yours in the comments below. Mary M. I love Canada. A vacation to Canada to look at bikes is heaven to me. Ray M. Living in a frozen tundra, it’s nice to be surrounded by steel and chrome, then it’s kinda like the countdown to riding season. Being such a girl, lol, I like to look at the clothes and stuff too; man, it’s everything all into one. Customization ideas, moto racing, I can’t wait! Ian S. To ogle over the latest bikes in person and throw a leg over them. Also look for any deals on accessories. And most of all get to hang out with thousands of other enthusiasts all there for the same reasons as me. Al F. The dream of having one of each! Ursula B. always need to see what is new and I have snow season so I think shows make snow season just a tiny bit shorter! Al F. Oh and this year to have my kids try the bike riding! never too early to get them hooked so I have a daughter to go riding on trips with! Karen G. If it is in my city…..I will be there! Mark K. Meeting the tour venders like Rene Cormier and people like Paddy Tyson is always a bonus. Terry F. Well, actually for me the reason to attend is twofold. One, to catch up on the newest and latest products, and secondly it is a chance to renew friendships with people in the business and make some new relationships as well. Pam B. It’s all about the eye candy, and I’m not referring to the scantily clad models, although I can see that they are appealing to some. Bruno G. To meet & greet. To view and feel. To dream and smile. Dave L. You’re all wrong. 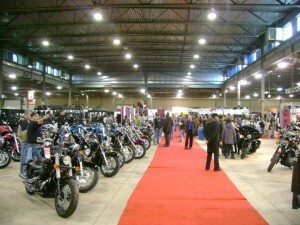 The most compelling reason to attend is to see Glenn (Roberts) and the gang at the Mojo (Motorcycle Mojo Magazine) booth. Kees S. To see if something in a 2012 variety tastes better than my 97! Barbara W. Just love looking at the iron and smell the rubber of the tires…..
Don N. I enjoy seeing old friends.